GUANACASTE, Costa Rica, April 6 (SEND2PRESS NEWSWIRE) — Costa Rica Development Group (CRDG) announces the opening of its newest community, La Montana at Coco Bay (www.lamontanacostarica.com). La Montana makes the dream of home ownership in a tropical setting a reality. Located along the Pacific Coast between Ocotal and Playas del Coco, La Montana is the latest addition to CRDG’s established residential community of Coco Bay Estates. The ultimate in living green, La Montana home sites are on prime Costa Rica real estate, offering sweeping views of crystal blue seas and lush rainforests teeming with wildlife. Residents can custom-build their dream getaway on home sites starting as low as $70,000, or choose a finished custom home in the $300,000’s. Residents will also have access to the newly-open amenities at The Club at Coco Bay, including a state-of-the art tennis and fitness center, a 37-meter tropical pool with waterfalls and water slides, and a private beach club on Ocotal Beach. On any given day at The Club at Coco Bay, people from all over the world can be found relaxing by the pool, playing tennis, riding jet skis, mingling on the beach, and watching the monkeys swing around the club grounds. La Montana is close to shops, restaurants, medical facilities, the exquisite Four Seasons Resort and an international airport. Strong Internet access plus abundant non-stop flights to the U.S. make telecommuting easy. Low residential taxes, unrestricted ownership for non-nationals and excellent relations with the U.S. make Costa Rica real estate a good investment. The Financial Times of London recently named Costa Rica one of the most attractive locations for Foreign Direct Investment (FDI) in Central America and the Caribbean. 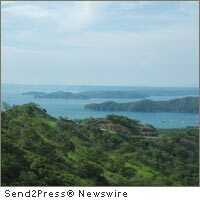 CRDG streamlines the process of buying property in Costa Rica at the La Montana development. It is easy for La Montana owners to secure comprehensive property management services while they are away, or if the property is used as an income-generating vacation rental. For more information on owning a home in Costa Rica, go to www.lamontanacostarica.com, email gc.crdg@gmail.com or call 800-383.0903.